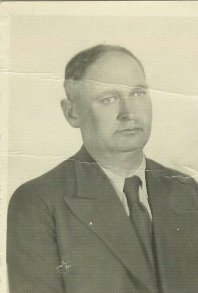 Adolf Robicek was born in Ni, Yugoslavia near Belgrade on December 13, 1893. The family name derives from the Pilsen region of Czechoslovakia. Adolfs father, Alexander, was born in Sarajevo. All of the sons were alternately named Alexander, then Adolf, then Alexander and so on....however, after WWII, Adolf was out as a popular name! Adolf had one sister, Ana Lebl (Sashas mother), who died in a concentration camp. Alexander, Adolfs father, once went to a nice restaurant on a trip to Vienna. He ordered steak, which tasted so delicious that he ordered another. When the bill arrived, he pointed out to the waiter that the total was too low, since he had ordered a second helping. It turned out that the place was a horsemeat establishment and the bill was indeed correct. The double helping came back to haunt him! During WWI, Adolf was in the Army. His unit was guarding a crucial railroad junction. During an attack by the Germans, all of the members of his unit were killed. He was injured when a heavy object fell on his foot and crushed his toe. For three days and nights, he crawled around and adjusted the railroad tracks to ensure that the trains continued on their schedules. For his heroism, he received a medal; in the citation, the king called him brother. Because of the medal, Alex and Vera didnt have to pay tuition for gymnasium, Adolf had free unlimited travel privileges on all trams and buses, the kids would have tuition-free schooling at the college of their choice (in or out of Yugoslavia). Vera had planned to study medicine, while Alex was undecided, although it would have involved math. Adolf was an artist and very creative, but the family didnt think that to be a good career choice at the time (artists were frowned upon) so they ensured that he didnt go to art school; instead, he went to business school. Adolf worked for the government in Danube shipping administration in the foreign department. The family received free travel privileges, so Marianne and the kids went to Vienna several times by boat, getting treated like royalty along the way. He was a kind, fair, yet opinionated man with an imaginative humor....a born leader. He didnt feel that children should be seen and not heard, but felt that if one said something, it should be meaningful. Thus, Alex and Vera grew up to be factual people. Adolf spoke several languages, including Yugoslav, Bulgarian, German, Italian, Greek, Turkish, Albanian and Russian. He enjoyed reading aloud at night; Marianne would fall asleep and 11-year-old Vera would sneak in and listen to him reading Russian, English and other authors.